Hello everyone! It's Wednesday, so that means it's Color Throwdown time! This week's challenge is being hosted by Lynn Put and I was thrilled to see some green on board! The colors were just perfect to get out my trusty Copics and color up this rose image. ACCESSORIES: Leafy Flourish Dienamics by Flourishes, Diamond Stickles, Copics, Oval and oval scallop punches by SU. We'd love to see what you create with these colors! Remember, if you don't have the exact colors, please feel free to substitute colors that are close! Make a card or paper crafted project and post it to your blog. Then use the direct link from your blog and link it to the Color Throwdown blog using the linky tool. If you post to an online gallery please add CTD181 to the keywords. For more inspiration, you'll want to check out the other design team members' creations: Barbara Anders, Broni Holcombe, Danielle Kennedy, Joan Ervin, Keva Brown, Kerri Michaud, Kristin Eberline, Lori Tecler, Lynn Put, Tammy Hershberger, and our fabulous guest designer - Jenny Peterson! Beautiful flowers, Wanda, and I love your corner flower with the vine! Gorgeous image and looky at you with your wonderful colouring skills :) Great use of the colours too. Absolutely beautiful card Wanda!!! 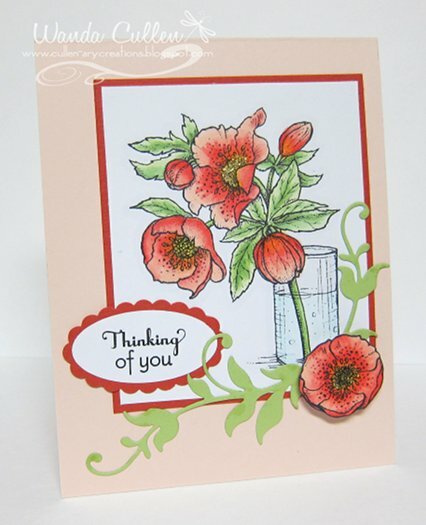 Your coloring is fabulous and your popped up flower with ivy adds the perfect touch! WOW! Your card is so beautifully coloured...absolutely gorgeous! Gorgeous, Wanda! That's one of my favorite FLLC sets, and I love the Leafy Flourishes die cut with it! Ooooh Wanda... this is totally yummy!!! LOVE the color combo and have got to try to play! Love your coloring... awesome!!! Hope all is well with you! Thanks for visiting my blog tonight!!! Mercy, girl....your poppies are sooo gorgeous!!!! Your coloring is over the top and the poppy and vine leaves in the corner add such an elegant touch....you do such beautiful work, Wanda!!! Just beautiful Wanda! I love the popped up flower in the corner with the leaves! Thanks so much for visiting my blog! I got a chance to come and visit yours and I love your work. I am your newest follower. I look forward to sharing our creativity and inspiration! Wanda, this turned out beautifully! Fabulous coloring on those roses! This is so pretty, Wanda! 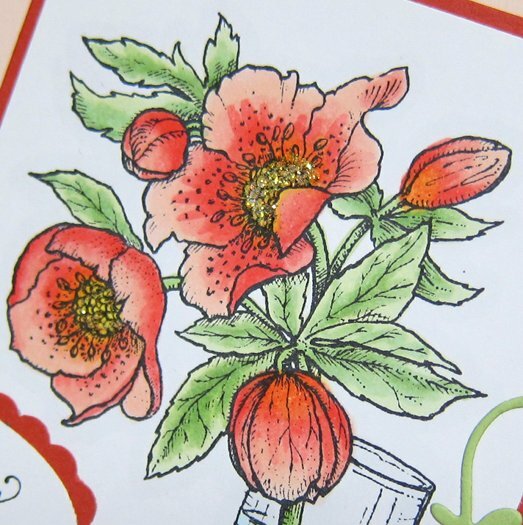 Love how you colored the flowers and the little bit of added sparkle at the centers.